What if Karl Ove Knausgaard’s My Struggle were written by a woman? What if My Struggle by the Norwegian writer Karl Ove Knausgaard were written by Carla Olivia Krauss of Cobble Hill, Brooklyn. Would we care as much? 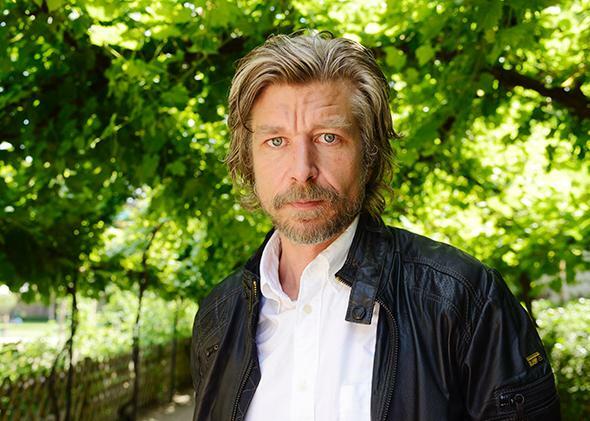 Karl Ove Knausgaard, author of My Struggle. After I recommended My Struggle to a friend, she texted, “What if a woman wrote it?” I wrote back, “or an American?” and I began to wonder what would happen if the literary sensation were written not by the handsome Norwegian writer Karl Ove Knausgaard but by Carla Olivia Krauss of Cobble Hill, Brooklyn. Would Lorin Stein, the editor of the Paris Review, still have declared in the New York Times book review that it “solved a big problem of the contemporary novel?” Would Lorin Stein of the Paris Review even have opened it? I don’t think we would be able to tolerate, let alone celebrate, this sort of domestic diarylike profusion from a woman. A 30-page riff on going to a party with children, and trying to balance your food while watching your child, and what exactly happens to her shoes, would appear, if a woman wrote it, both banal and egoistic. (Knausgaard writes, “I felt a surge of warmth in my breast. Leaned over and picked up a diaper and a pack of wipes while Heidi clung to me like a little koala bear. There was no changing table in the bathroom, so I laid her on the floor tiles, took off her stockings, tore off the two adhesive tabs on the diaper and threw it into the bin under the sink while Heidi watched me with a serious expression. ‘Just wee-wee!’ she said. Then she turned her head to the side and stared at the wall, apparently unmoved by my putting on a clean diaper, the way she had done ever since she was a baby.”) Reviewers and readers alike would think it was narcissistic, well-traveled, self-indulgent. The novelist Hari Kunzru told the New York Times that Knausgaard “has the courage to say ‘my ordinary life as a father in a regional town is going to be enough to hold a reader’s attention.’ ” But what in a male writer appears as courage or innovation or literary heroics would be read, in a woman, even by the liberal, enlightened, and literary, as hubris or worse. As even Knausgaard’s passionate fans admit, he walks the line between the boring and the profound—one review in the London Review of Books was titled “Each Cornflake”—but Carla Krauss would pretty universally appear to be nattering on about inanities. And I am not just talking about the parenting sections but even the long, shapeless passages about wandering as a teenager through parties. I am not trying to make the point that male readers and critics would dismiss Carla, which they would, but that female readers and critics would as well. I mention this because of the enduring fantasy of a shadowy male literary establishment that discriminates against women writers, when in fact the discrimination is much trickier and more pervasive than that. When Carla Krauss’s My Struggle hit the stores, there would be a barely subterranean question embedded in the response: What makes her think her experience is so important or interesting or special? The particular variety of rage aimed at women who document their daily lives, especially if they don’t involve a childhood of poverty or abuse or illness, is deeply entrenched and irrational. It’s not just that we don’t think of what they are doing as art, but that it annoys us, riles us. It feels presumptuous, vain, narrow, feminine, clichéd. It is not chic the way Knausgaard’s stormy ruminations on the minor oppressions of family life are chic. Take Rachel Cusk, who was accused of being “petty and irritable” in her artful memoir, A Life’s Work. I imagine to this committed Knausgaardians would say that they are responding to the quality of his writing and thinking. But I’m convinced that even if Carla Krauss were writing and thinking on an equally excellent level, readers would still be impatient and irritated. They would take her equally well-observed sprawling minutiae as an impingement on their time and attention. What seems novel and fresh in a tall, craggy male writer would appear grandiose and humdrum in a female one. In part this is because the form, insofar as it is “solving a big problem of the novel,” is solving that problem only for men. Women have long written about the anomie of domestic life. In Mrs. Dalloway, Virginia Woolf intelligently gives us all of life through shopping for flowers for a dinner party; in 1962, Doris Lessing’s The Golden Notebook described menstruation, and the difficulties of raising a child on one’s own, and went deep into the preparation of scalloped veal and mushroom cream sauce for a lover. (Even in Irving Howe’s largely positive review of The Golden Notebook, at the time, he wrote of its heroine, “She whines, she is a bit of a drag, she often drives her men crazy,” and mentions “her steady groaning about her writer’s block.”) In the ’70s we had a great blossoming of feminist novels on the private angst of the playground (including my mother’s novel Up the Sandbox). What is new or unfamiliar or stirring is a man taking on these topics. In fact part of the pleasure of My Struggle is that it imbues ordinary bourgeois liberal life with a stylish and edgy glamour; it affirms for a generation that its concerns, its alienations, its small resentments are dramatic, important. For a certain set of readers, My Struggle casts a moody romantic light on picking one’s kids up at the nursery or shopping for pasta for dinner or worrying about whether you have a nice enough apartment or quarreling with your spouse. It elevates our struggles to Struggle, and for this we are grateful, admiring, effusive. Cooking lobster for a dinner party is transformed into: “all the attractive intricate details, like the grooves in the claws or the armor-like tail shell: didn’t they look as if they had been forged in the workshop of a Renaissance craftsman?” But if a woman wrote it, it would not have the same glamour; it would be drab, familiar, whiny. Some reviewers have pointed out that there is something “bloglike” in Knausgaard’s style, but if he were a woman, that compulsive recording would evoke not formal innovation but Mommy blog. In some legitimate sense, male novelists taking on the topic of the new, equal (or equalish) parenting is pioneering. One of the cultural currents Knausgaard struggles with is changing definitions of masculinity. There is a scene in the novel where his pregnant wife gets locked into a bathroom and no one expects him to be the one to break down the door and get her out. The tormented, sensitive father, who is actually caring for the children and shopping for dinner, yet nonetheless suffering from nameless malaise, is a relatively new territory for literature in a way that similar ruminations would not be for women. However a large part of our intolerance toward women writers closely reading domestic life is simply plain old-fashioned, deeply entangled sexism, of the variety Virginia Woolf took on in A Room of One’s Own. It seems very likely to me that in spite of huge political progress, an ambitious literary female writer would still feel constrained, she would feel she had, for instance, to be funny, in order to earn or woo her readers’ attention. She would never get away with the dead seriousness (and self-seriousness) of Knausgaard’s approach. I’m not arguing that less attention should be paid to Karl Ove Knausgaard, or that he is not justifiably celebrated and cherished, but rather that Carla Krauss, hard at work in a coffee shop around the corner from her children’s school, should be tolerated, given a chance, heard.